How do you follow up a record-breaking, SRO, bona fide hit? If you’re Don Hite, artistic creative director at the Main Street Theatre, you roll the dice. And that’s exactly what Hite is doing with the upcoming production of the classic American musical, Guys and Dolls, opening October 17 for a two-week run. So why Guys and Dolls? As Hite explains, it’s the perfect show for integrating both adult and young performers. And that’s exactly what he’s done, peppering the cast with stand-outs from Broadway’s Music of the Night as well as some newly discovered talent. One such shining star that local audiences may be bragging “I knew her when…” in the not-so-distant future is the luminous high schooler Hannah Brown in the role of the naïve missionary Sister Sarah Brown. With singing and acting chops belying her teenage years, Brown lit up Broadway’s Music with her sensational portrayal of Evita Peron. Playing Sarah Brown’s challenging love interest, Sky Masterson, is guest artist Mark Edwards. A working New York stage actor, Edwards brings experience and inspiration to the younger members of the cast. “Just having an actor of Mark’s caliber sharing the stage makes everyone else work that much harder,” Hite said. Hilton Head resident Jack Firestone brings a degree in dramatic arts from Syracuse as well SAG/AFTRA membership to the role of Nathan Detroit, made famous on film by none other than Frank Sinatra. “Jack has that authentic New York swagger that the role demands, plus the charm to hold onto his long-suffering fiancée, Miss Adelaide,” Hite said. Savannah’s Maggie Hart will be stepping into the marabou-trimmed slippers of nightclub chanteuse Miss Adelaide. A much-in-demand actress, Hart is fresh from The Collective Face Theatre Ensemble’s production of Grey Gardens, where she played the lead role of Little Edie. Rounding out the cast is a colorful ensemble of card sharks, fast-talking dice throwers, saucy chorines and strident missionaries. 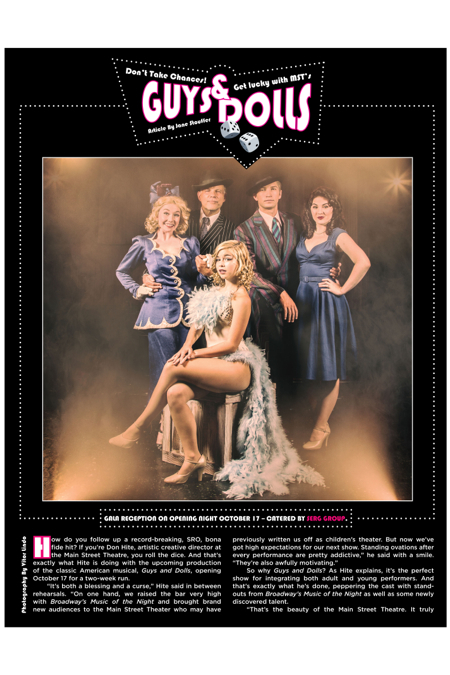 Audiences will be sure to spot Main Street Theatre favorites Dylan Brown, Josie Maldonis, Hannah Schuler and Bridgett Leysen among the high-stepping Hot Box Girls. And assuring show-stopping moments with crowd-pleasing numbers like “Take Back Your Mink” and the rollicking “Sit Down, You’re Rocking the Boat,” are A-list choreographers Fred Talkensen and Dante Henderson, returning once again to the Main Street stage. 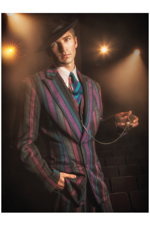 As Hite has a list of Broadway insider connections longer than the line of traffic on Highway 278 on a Saturday in July, it should come as no surprise that he has managed to obtain the original costumes from the 1992 Broadway revival of Guys and Dolls. These dazzling, priceless costumes were designed by William Ivey Long, the 13 times nominated, six-time Tony Award-winning costume designer and chair of the American Theater Wing. Long has costumed over 100 Broadway and off-Broadway productions, including The Producers, Hairspray, Cabaret and the current production of Cinderella. Hite discussed this production of Guys and Dolls with Long during a recent visit to Manhattan. “He [Long] was showing me the incredible detail in these costumes—hand-sewn beading, layers of downy feathers, brilliant fabrics. It is such a privilege to have these works of art on our stage,” Hite said. Yes, it appears that Hite has rolled the dice and they’ve come up deuces: a pair of back-to-back hits. The gala opening for Guys and Dolls will be held Friday, October 17, with a catered reception beginning at 5:30 p.m. for a 7 p.m. curtain. Gala tickets are $50 for adults, $25 for students, and are an important fundraiser for the theater. Order tickets by calling (843) 689-Main (6246) or online at msyt.org. Discounted Main Street Theatre season tickets are still available, but not for long.